Of all the designers featured in the Poster Girls exhibition, none were as glamorous as the Scottish-born sisters, Doris and Anna Zinkeisen, whose precocious talent, beauty, and modernity propelled them into the centre of interwar London’s fashionable art scene. Typically described in the pages of society papers as ‘extremely pretty’ and ‘brilliantly clever’, it would be easy to view the sisters as the epitome of the entitled ‘bright young things’ parodied by Evelyn Waugh in Vile Bodies (1930). But there was so much more to Anna and Doris than this, as their extraordinary body of work testifies. And as the posters in London Transport Museum’s exhibition show, it was a body of work that put confident, independent, women firmly on the centre stage. Born in 1898, Doris was the elder of the two by three years. Despite the age gap, they trained together at the Royal Academy Schools and by the mid-1920s were sharing a studio in London. The range of their work was dazzling, including book illustration, publicity for railway companies, murals for the Queen Mary and Queen Elizabeth ocean liners, and society portraits of the fashionable ‘set’. Doris also developed a hugely successful career as a stage and costume designer for theatre and films, working alongside Noel Coward, Charles B Cochran and Cole Porter. But it is their depiction of women that strikes the viewer as truly modern. Take, for example, the panel posters produced by Anna for the inside of Tube carriages. These show dynamic, active, women who are not defined by their relationship to men – a far cry from most commercial art of the time. 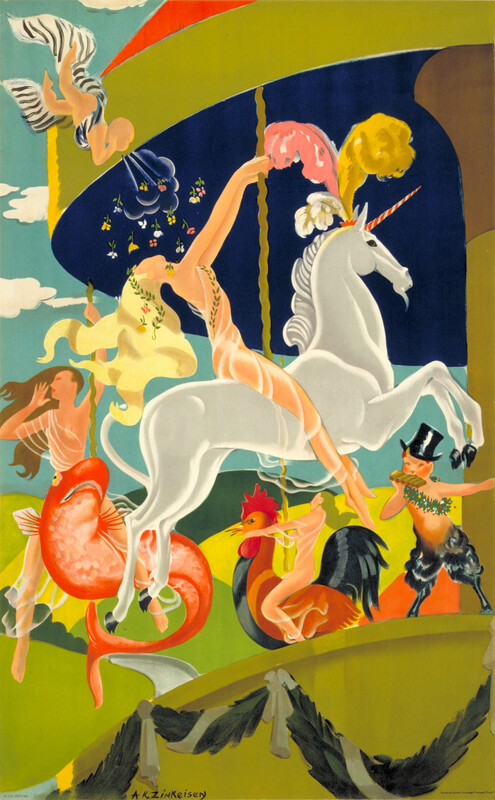 Similarly, Doris’ unpublished poster of female theatre goers (1939) depicts a group of young women enjoying a night out without an obvious male chaperon (shown above). And the subject matter, too, is far removed from traditional ‘feminine’ commissions. Anna’s output for the Underground included motor shows, air displays and military parades. There was also something distinctly racy about their portrayal of the modern woman. 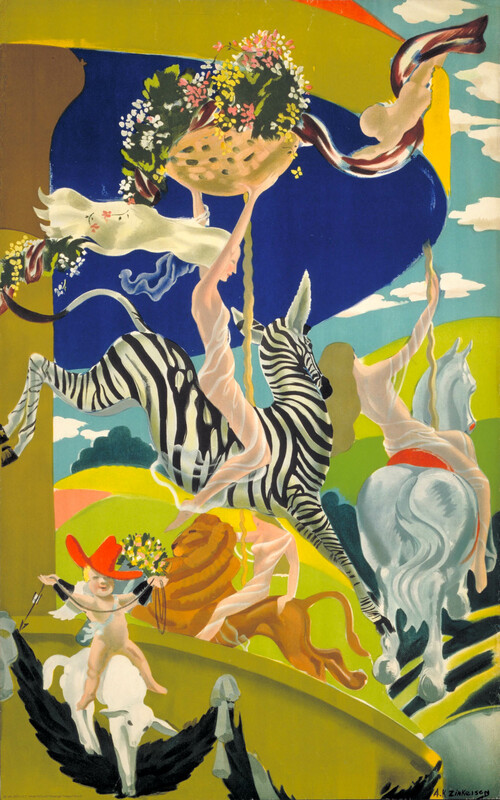 The scantily clad revellers of Anna’s Merry-go-round poster (1935) would raise eyebrows even today, while Doris’ costumes for the West End play Nymph Errant (1933) were regarded as so revealing that the chorus girls refused to wear them. In the changed circumstance of the Second World War, their work became less frivolous but no less assertive, as their moving depictions of female war workers demonstrates. Inspired by the Zinkeisen sisters and their female design contemporaries, London Transport Museum is hosting a very special evening event this Friday celebrating the Golden Age of the 1920s and 30s poster design. Experience vintage girl power and iconic art movements through curated lectures and workshops and discover Poster Girls after hours. With music, dancing and bars it promises to be a fun night.